HA NOI (VNS) — Authorities should pay attention to cultivating macadamia effectively and building a trademark for the nut as the tree could bring high economic benefits, an official said. These benefits were especially important for Viet Nam as it is seeking the growth of value-added products in the agriculture sector. 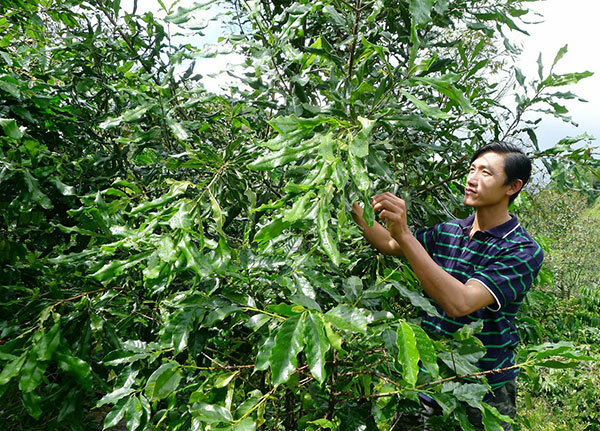 Nguyen Tri Ngoc, general secretary of the Viet Nam Agriculture Association, said this during an online discussion on macadamia held in Ha Noi on Tuesday, adding that growers also needed to care much about the number of trees they planted, cultivation areas and output. "One of the most important issues is a suitable cultivation area and high quality seeds. Even though the north-western and Central Highlands regions offer conditions best suited for the plant's growth, it has some areas, which are not good for the tree," Ngoc said. He added that rubber and coffee had been key pillars in Viet Nam's agriculture industry over the past century and undergone several ups and downs, noting that finding markets for the nuts was also a critical issue for avoiding the situation of bumper crops and low prices. "Businesses are required to participate in cultivation during an early period to link production and purchasing with their commitments," he said, adding that the commitments would make them responsible for their investment. Huong Hoe, former director of the Forest Inventory and Planning Institute, said Viet Nam was estimated to have around 1 million macadamia trees covering an area of 5,000 ha (ha). Hoe said he had visited macadamia cultivation farms in Australia, which had climate similar to Viet Nam's Central Highlands region. The Ministry of Agriculture and Rural Development also supports the tree's cultivation. Sharing his ideas, Nguyen Duc Huong, vice chairman of LienVietPostBank, said Viet Nam had missed the opportunity to earn money from macadamia farming in the Central Highlands region over the past decade. Several farmers said people were now waiting in queues to buy their macadamia produce, Huong said. Viet Nam could even enjoy higher profits due to favourable weather coupled with cheap labour costs. He said the bank had built a value chain for macadamia cultivation. They would lend to farmers, while the Him Lam Company would provide seeds, technical consultancy, as well as build a processing factory, ensuring purchasing and buying insurance for farmers. "It means that farmers would have no risk in capital."